Emergency medical staff at Kelowna General Hospital are now able to save valuable time in assessing and treating critically ill or injured emergency patients, thanks to the generosity of hundreds of volunteers who donate their time to serve their local hospitals. The new Flash CT Scanner arrived at KGH last week and is considered to be one of the best CT Scanners available on the market today. The leading edge technology allows medical staff to rapidly image their patients more efficiently than ever. 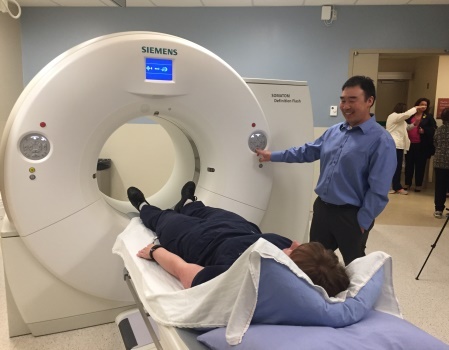 The new scanner has been dedicated exclusively for use in KGH’s Emergency Department, advancing the care teams ability to treat emergent patients with more efficiency than ever before. The acquisition of the new CT Scanner was made possible through the generosity of the hundreds of volunteers who assist the Kelowna, Rutland, Peachland and Winfield Auxiliaries. The hospital Auxiliaries are vital to supporting the hospital and operate on the generosity of these volunteers. In 2015, all four Auxiliaries joined forces and committed to purchasing the $1.9million CT Scanner. The funds were generated solely from the net proceeds raised through KGH business ventures, catering operations in Peachland and Winfield and the Rutland Thrift Store. Brad Brad's recovered with the use of an ECMO machine.